It is not often you get to add a new title to your life, “author” was not something I had ever dreamed I would be able to add. Sure, I come from a line of authors, but me? Write a book? Yeah right. Yet I did, and it found a home with Powerful Learning Press, and now it is almost ready for the world to read. In fact, I sent it out for review to a few people this week – gulp! 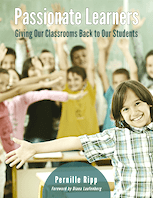 On May 14th, my first book “Passionate Learners – Giving Our Classroom Back to Our Students” will be released as an e-book. This book is my heart. It chronicles my journey from a traditional teacher to whatever it is I am now. But it is not just about my journey, it is about giving the classroom back to all students. It is about ideas, little ones and big ones, that anyone at any point in their teaching journey can implement. It is about ease not about creating more work. But most importantly it is about passionate learners and how we can re-engage our students by giving the classroom back to them. I hope you will consider reading it. Here is a link to pre-buy it before the release date. If you would rather purchase a print version, we are currently exploring the interest in this. So if this is something you would prefer, please fill out this form. And did I mention the foreword is by the amazing Diana Laufenberg, a person I so admire. The book is so much better because of her. I recently came across an article about your book Passionate Learners: Giving our classrooms Back to our Students. I love the idea and would like to read the book, but cannot find it anywhere (I am in Canada). Even Amazon does not have it listed. if you could let me know where I could purchase one, please let me know. Thank you.